All shooters reach a brick wall where continued practice tends to tear down skills, not improve them. Where this wall is depends on individual skills and experience. Meanwhile most of us cannot afford to shoot 500 or 1,000 rounds a day like the pro shooters do. So, in looking at how to get the most of a single box of ammo, I have developed a course of practice covers a number of the basic skills. Each stage builds on the skills that were practiced on the previous stage. 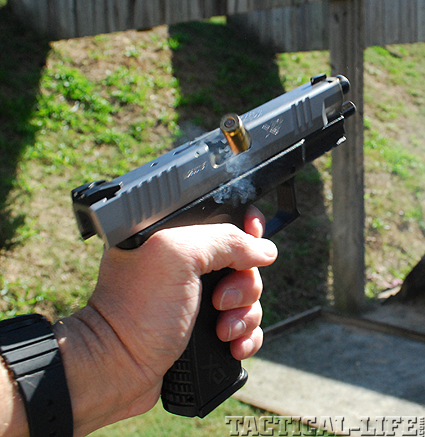 While shooting on IDPA or ISPC targets can be fun, they are not well suited for practicing basic skills. To keep things simple, a NRA B-16, 25-yard pistol target is used for the entire course of fire. The black center of this target is 5 5/16” in diameter, and the object of the drill is to keep all of the shots in the black area of the target. The times shown are recommendations as a starting point for a mid-level shooter. By using a standardized practice routine, the shooter has a tool to measure individual improvement. This simple course of fire addresses the majority of the basic skills. Don’t overlook, or give up on, the 25-yard slow fire drill. 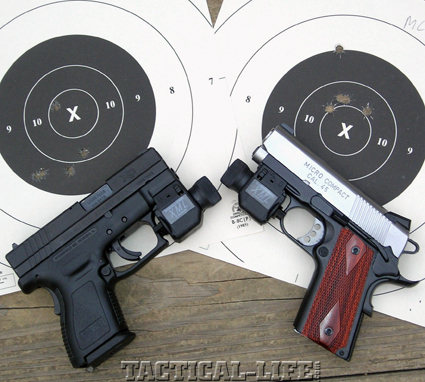 At 0-10 yards, we can get away with a lot of sins—such as poor sight alignment and sloppy trigger control. Shooting a 5” bull’s eye at 25 yards will quickly highlight any of the aforementioned bad habits. It is also a great confidence builder. If you are keeping all of your shots in the black at 25 yards, the bull’s eye looks huge at the seven-yard line. As with any skill, a proper training regimen is needed to improve one’s skills. This course represents a baseline starting point. As your skills improve, decrease the time limits and increase the ranges. You will be amazed at how quickly it will happen. Purpose: To reinforce the necessity of proper sight alignment and trigger control. Instructions: Fire five rounds with no time limit. Evaluation: All rounds should be within a group, centered on the target. The size of the group will vary given the skill of the shooter. If all shots are not within the black scoring rings of the target, the shooter should decrease the range until he can meet the training objective. Purpose: To reinforce the proper draw stroke, sight acquisition and trigger control. Instructions: From the holster, draw and fire one round in the mandated time limit. Repeat five times. Evaluation: All rounds should be within a group, centered on the target. The size of the group will vary given the skill of the shooter. If all shots are not within black scoring rings, the shooter should increase the time until he can meet the training objective. If the grouping is less than 2”, the shooter should decrease the time to match his current skill level. Purpose: To reinforce the proper draw stroke, sight acquisition, trigger control and trigger reset. Instructions: From the holster, draw and fire two rounds in the mandated time limit. Repeat five times. Purpose: To reinforce the proper draw stroke, sight acquisition and trigger control, using only the weapon hand. Instructions: From the holster, draw and fire one round, using the weapon hand only, in the mandated time limit. Repeat five times. Purpose: To reinforce the proper sight acquisition and trigger control, using only the support hand. Instructions: From a ready position, fire one round, using the support hand only, in the mandated time limit. Repeat five times. Purpose: To reinforce the proper draw stroke, sight acquisition and trigger control, and reloading procedures. Instructions: Load the pistol with one round and an empty magazine. Set up each spare magazine with two rounds. From the holster, draw and fire one round, reload, and fire one round in the mandated time. Then, reholster the pistol. The pistol should have a round in the chamber and an empty magazine. Repeat five times. Purpose: To reinforce the proper draw stroke, sight acquisition and trigger control, and trigger reset. Instructions: Draw and fire five rounds in the mandated time. Instructions:	Fire five rounds with no time limit. And there you have it, a simple and straightforward plan to get the most out of your training time with one 50-round box of ammunition and your preferred self-defense handgun. Army: no bullet wound found in soldier Skype death.